What if the horses urinating on Michigan Ave were required to eat only foie gras? Less odiferous? 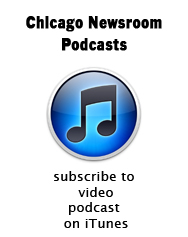 It’s a suggestion on this week’s Chicago Newsroom. Other subjects: Although last, Illinois may become concealed-carry. Privatized recycling, the increasingly combative if predictable runoff elections, a half-sized City Council and Goose Island Beer. That and more with Thom Clark (Community Media Workshop), John Dempsey (WLS-AM) and Paul Meincke (ABC-7).